Rory McIlroy's record 16-under total was part great play, part soft greens. Photo copyright Darren Carroll/USGA. Has the USGA gone soft? No, that was just the greens at Congressional. 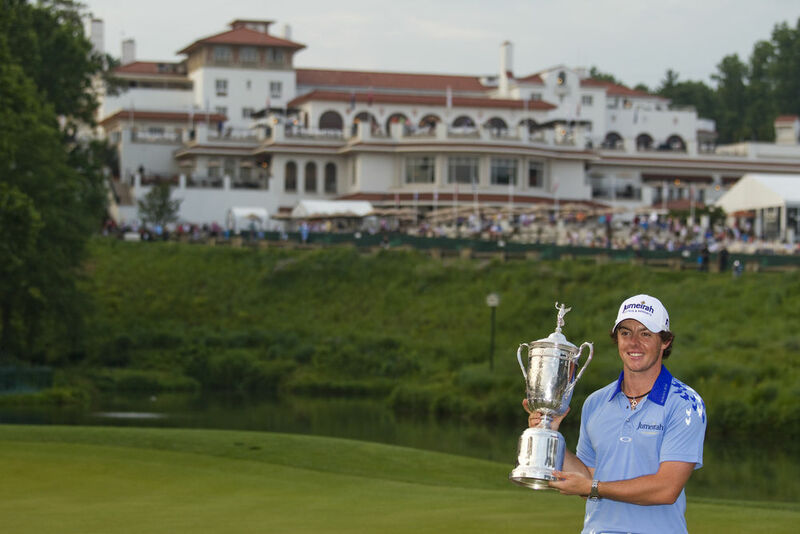 Believe it or not, the philosophy on U.S. Open course setup was basically the same in 2006 at Winged Foot and 2007 at Oakmont when the winning score was 5-over par as it was at Congressional this year when 20 players finished under par and Rory McIlroy was 16-under. What changed were the course and the conditions. It is true that Mike Davis introduced some changes when he took over the U.S. Open setup role in 2006. And some of them on the surface deserve the “kinder and gentler” label. There’s his penchant for moving tees up on various holes each day. With the course not playing to its maximum length, it does play a little bit easier, especially when the occasional par four is brought within range of the tee shot or a par five is shortened to within the range of most of the field getting home in two. These changes do indeed help scoring a bit. But their main purpose is to make for more interesting golf by creating more risk/reward possibilities, not to make things easier. The flip side is that Davis is a firm believer in firm playing conditions. And firm playing conditions make it harder to score, more than balancing out the other factors. The overall idea that the U.S. Open should be the most challenging tournament of the year has not changed. In fact, modern agronomy and course maintenance practices make it possible to keep greens firmer than ever even under less-than-ideal conditions (but not with the type of soil at Congressional in the type of conditions that prevailed this year—more on that later). That’s the biggest reason why U.S. Open scoring was higher, on average, in the 2000s than it was in the 1980s or 1990s*. *My take is that the USGA generally gets it about right these days, except that I would like to see the greens a little bit receptive rather than trying to keep them extremely firm. Hard greens lead to defensive golf and too few birdies. But soft greens like we saw at Congressional are not ideal, either. The exceptions in recent times when red numbers have been commonplace were 2011 at Congressional and 2003 at Olympia Fields. It’s no coincidence that those came at courses located in parts of the country where the type of soil does not promote fast drainage. It’s also no coincidence that places like Pinehurst and Shinnecock Hills—where the soil is sandy and drains quickly—have jumped into most-favored status when hosting U.S. Opens. Olympia Fields was a disappointing site not just because of a fairly uninspiring course, but because its greens were too soft even though it didn’t rain very much. Overcast skies and a little bit of rain were enough to spoil things. Washington, D.C.’s Congressional is a problematic site to begin with because it is in the “transitional zone” between North and South for growing grass. The club had so many problems that it decided to rebuild its greens just two years before the championship (reopening the course just a year before). All reports on the new greens were positive. But ultimately the newness of the greens might have been part of the problem. The first part of the double whammy that affected this U.S. Open came with a heat wave the week before the championship. The greens were stressed, causing USGA and Congressional officials to decide to keep them watered early in U.S. Open week for fear of deterioration. Then came the second part of the double whammy: rain at some point in the day or night (mostly overnight) during every day of the championship. Outside of Rory McIlroy’s other-wordly 65-66 start, Congressional wasn’t that far off the mark of a usual U.S. Open test on Thursday and Friday. A score of 2-under 140 was good for a tie for third place. But then came the weekend and records for the number of subpar scores in both the third and fourth rounds. Players were shooting darts on their approach shots, and thus able to stop the ball near the flag more often. The difficulty of long putting and chipping or pitching to Congressional’s putting surfaces was negated to a large extent. It led to howls in some quarters that this was no U.S. Open. I never knew that there were so many fans of U.S. Open style golf. While usually the USGA gets hammered for “protecting par” at all costs, now they were being criticized for not protecting par. To be fair, most of the critics pointed out that the weather conditions were mostly to blame. But some either ignored that or, even if they conceded it, wanted the USGA to pull out all the stops, use all of the hardest hole locations, play every hole from the tips, do whatever was necessary to torture the players. But how about this? The British Open is often praised for letting conditions dictate scoring. If it was a dry spring that led to sparse rough, and if there’s little wind, the leaderboard might bleed red. But if conditions are tough, breaking par is an accomplishment. And it can be a great tournament either way. *That lesson was perhaps learned at Shinnecock Hills in 2004 when subpar numbers in the first two rounds were followed by a debacle on the weekend. And with Davis in charge, don’t look for the USGA to stick it to the players with an over-the-top setup at Olympic in 2012 to make up for this year. He’s not built that way. Olympic may well play tough, but that’s because it’s a historically difficult course located in San Francisco where it seldom rains in June. It is fair to question Congressional as an Open site. In addition to the agronomic and climate problems, there’s the matter of the layout itself. Bethpage received Biblical amounts of rain in 2009. It poured so much the week before the tournament that during the practice rounds Davis said he had already given up on firm greens—and that was before there was so much rain during the championship that it had to be extended to Monday because of the delays. And yet Bethpage, even in those soft conditions, was a sterner test than Congressional. But this good reporting by the Washington Post’s Barry Svrluga indicates that a return to Congressional is fairly likely, even if it does not become one of the more frequent stops. In fact, 2026 has already been mentioned as an appropriate date to return to the nation’s capital, that being the 250th anniversary of the Declaration of Independence. Who knows, maybe Congressional’s greens will have been rebuilt again by then. And maybe, just maybe, the weather will be better. Excellent, well-balanced analysis. I live in the Midwest, where we have heat, humidity, and thunderstorms during the summer. And whether we have majors or regular tour events, the story is the same: rain = soft fairways (translation: wider) and soft greens (translation: much larger targets) and yet people complain about low scores. Members of host clubs who’ve spent millions to make their course tough for the pros instead are embarrassed when the best in the world bring their course to its knees. But it’s crazy. If the wind blows, greens and fairways firm up, players have less control of their golf balls, and scores go up. But if it’s moist, humid, rainy, scores are going to be low. So what?